Look Out! These recipes are for White Food. 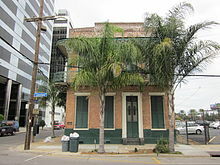 Lafcadio Hearn House in New Orleans. Made of potato, coconut, cream, egg whites, milk, sugar and almonds, these concoctions suggest the type of bland, colorless food that the No White Food blog plans to avoid. But these delicacies are something special — collected and transcribed by the writer-adventurer Lafcadio Hearn who lived in New Orleans from about 1877 to 1890 and wrote for several newspapers. The recipes are transcribed just as he wrote them, with unusual spelling and style. You won’t find precise measurements or involved processes here. My particular favorite is the recipe for Syllabub, a beverage used as a restorative after illness or fatigue. Apparently Hearn’s landlady would cosset him with a nourishing syllabub when he was under the weather. 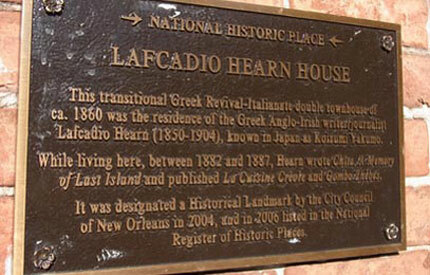 Historic plaque for Lafcadio Hearn house in New Orleans. Very nice potato puffs may be made by mashing seven or eight potatoes smoothly, and mixing in with them two well beaten eggs, two tablesspoonfuls of melted butter, also well-beaten, and a cup of milk. Pour it into a pan and bake in a hot stove. Take 6 boiled potatoes – cold mashed potatoes will do – add three tbsp of grated ham, a little pepper, salt and chopped parsley, also, the yolks of three eggs; form into balls, dip in egg and roll in bread crubs; fry in hot lard; garnish with parsley. Pour boiling water on them and let remain in it a few minutes. Remove the skins, throw the almonds into cold water, drain them from the water, but do not wipe them. Let dry and store or use in other recipes. Four cups of water, 2 -1/2 c. fine white sugar, four spoonfuls of vinegar, and a piece of butter as large as an egg; boil till thick, or about 3/4 hour. Just before removing stir in one cup of desiccated coconut, and lay in small, flat cakes on buttered plates, to cool and harden. 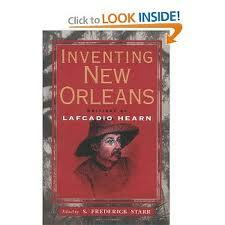 Inventing New Orleans, by Lafcadio Hearn. Book Cover. Take the juice of a large lemon, and the yellow rind pared thin; one glass of brandy, two glasses of white wine, and a quarter of a pound of powdered sugar. Put these ingredients into a pan and let them remain one night; the next day add a pint of thick cream, and the whites of two eggs beaten together; beat them all together to a fine froth, and serve in jelly glasses. The following text is an excerpt from The Atlantic, Corby’s Table , 2002.05.01, a book review written by Corby Kummer. I use this excerpt in classes on Food Writing that I teach online for UCLA, and at other venues, as an example of how to write an engaging book review and display the essence and motivations of the author. Not all women like to cook, of course. But like it or not, most women’s lives are entwined with food. The recognition that food and everything having to do with it can offer perspective on many aspects of women’s lives led Barbara Haber to build the culinary collection at the Schlesinger Library at Radcliffe into a powerhouse of women’s studies. In the thirty years since Haber arrived in Cambridge, from Milwaukee by way of the University of Madison with a degree in library studies, the collection has become a magnet for scholars, journalists, and cooks. The Schlesinger is now a national touchstone for anyone interested in food, not just because it houses the books and papers of Julia Child, M.F.K. Fisher, and Ella Fitzgerald (an enthusiastic cook, it turns out), among many others, but because Haber herself is so magnetic. From Hardtack to Home Fries offers a collection of nine wonderfully readable essays on an unexpected range of topics that have captured Haber’s interest. Every reader will have her or his favorites. I know that Haber herself is particularly proud of her essay on Mrs. Henrietta Nesbitt, the cook who made famously bad food in the White House of Franklin and Eleanor Roosevelt. More than just a terrible cook, Haber finds in her a woman Mrs. Roosevelt valued as a helpmeet, one who cared about the President’s health and about running a sensible household. Julia Child liked that chapter, too: in a sign of her regard for Haber, she wrote a warm endorsement for the back cover after decades of blanket refusals to blurb any book. 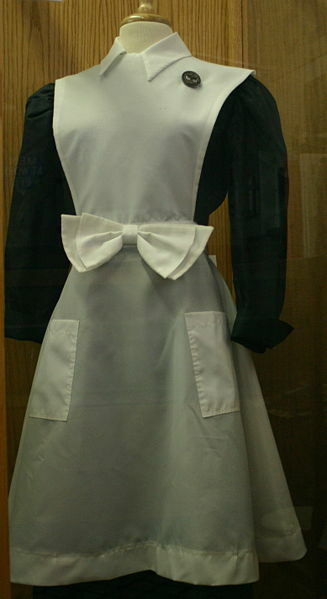 Uniform worn by women who worked for the Harvey Restaurants serving railroad travelers at stops in the western USA. My own favorite is a chapter on the Window Shop, a bakery, restaurant, and sui generis social-service agency for genteel Jewish refugees who arrived on the academic shores of Cambridge starting in the late 1930s. The oral and written histories Haber collected yield a portrait of a turbulent and fascinating time, along with a good recipe for Sacher torte. I was also pleased to learn about the Harvey Girls—those white-aproned purveyors of good food and rectitude along the Atchison Topeka and Santa Fe Railroad, in a chapter of special charm that recalls a rough and just-civilizing time in our not-so-distant past. A chapter on the early diet gurus Sylvester Graham and John Henry Kellogg offers a crackling (even snapping and popping) account of an odd turn in American health, which gave us our national breakfast not to mention ideas about diet both sensible and peculiar. Barbara Haber keeps her focus on women’s relationships to food—especially as it pertains to personal finances. She chronicles how several women found dignity, livelihoods, and their own identities by starting catering businesses and restaurants. A lovely last essay tells how she herself came to collect and study cookbooks; it also shows a touching understanding of her own relationship to her mother. An exceedingly valuable appendix includes notes on the many books mentioned throughout, with a bonus of many more recommendations. These capsule reviews are manna for any aspiring food and social historian. They offer a generous taste of the wealth of knowledge Haber has always freely shared. There are a few recipes, too—ones I’d like to make. “A modified Graham bread” shows what the health-promoting Sylvester Graham really had in mind: whole grains made appealing and somewhat sweet as a kind of bread, rather than just a sweet cracker for a campfire concoction with marshmallow and chocolate (although really, is there a better dessert than S’mores made over an open fire?). Gekochtes Rindfleisch, or boiled beef, sounds dull, but in the hands of the Viennese émigrés eking out a living at the Window Shop, it was a feast reminiscent of home. A feast it is, with its rich broth and fresh vegetables, and also a way of turning a humble cut into a one-dish meal that can last many days by being served as a soup or main course. Finally, baked fudge is an easy confection that demonstrates why Cleora Butler, the recipe’s author, became a Tulsa legend as a talented businesswoman and cook. Like many of the women Haber discerningly chose, she turned her culinary skills into a way of supporting herself and her family. Clean grapefruit skins that have been cut in half and fruit removed for use in another dish. Cut the peel in narrow 1/4 inch strips, the length of the halved fruit skin. Cover with salted water (1 pint of water to each tablespoon of salt). let boil 20 minutes. Drain off this water and cover rinds with fresh water (no need to measure) and boil 20 minutes. Do this again with fresh water. 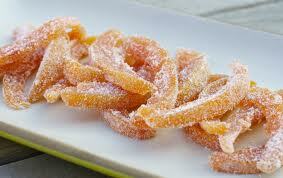 Drain off the third water and for every whole grapefruit use 1 cup granulated sugar. Let simmer until all the sugar is absorbed and the skins are clear. Roll in dry sugar and put in sun or heated oven (which has been turned off) to dry. Adapted from Charleston Receipts, an antique cookery book. What fun to find, by chance, that the Gastronomica Reader ,which includes my long article about Diana Kennedy and Mexican organic farming, is featured in a biblio encyclopedia run by an Estonian webarian! Fun because this connects directly to last week’s Wikimania 2012 in Washington, DC where I met the wikipedian from Estonia, Raul Veede. Synchronicity and random serendipity are the indicators I follow in order to avoid the contrived pressures of marketing, crowd control, issues management, individual greed and social aggression. Long live the randomness of the internet and the global volunteer efforts of wiki writers everywhere who are the activist-intellectual descendants of Thomas Paine. 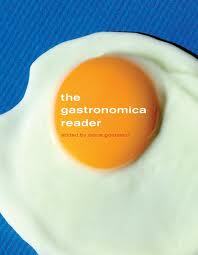 Resource: Gastronomica, The Journal of Culture and Food. Culinary Historians of Washington DC looks into the history of food habits, culinary practices, recipes, cultural quirks and people who cook. Washington Post Express recently published an article about C.H.O.W. members. So what do culinary historians do with their time? Cook, scour pots and eat. 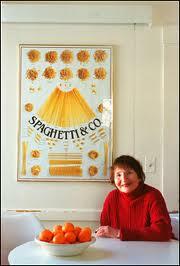 They also delve into the history of food preparation, recipe writing, cookbooks, cooking styles and kitchen implements. At each C.H.O.W. meeting there’s a table of cooking gadgets that people have brought in for discussion and i.d. by other members.